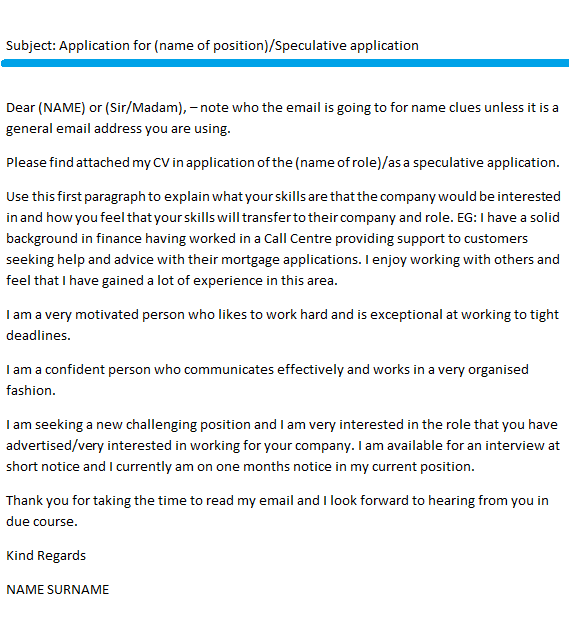 If you are applying for a job via email and want to write a good email to go with your CV then very much like a covering letter you need to make sure that you address it to the correct person if you know who that is and write it like a letter expressing your interest in the vacancy they have or submitting your CV on a speculative basis. 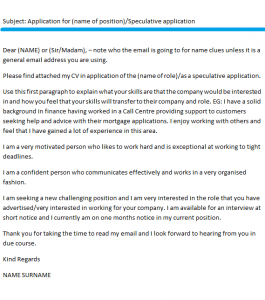 Your job application letter should be unique so it’s better amend this letter example as suitable before sending it to potential employers. Dear (NAME) or (Sir/Madam), – note who the email is going to for name clues unless it is a general email address you are using. Please find attached my CV in application of the (name of role)/as a speculative application. Use this first paragraph to explain what your skills are that the company would be interested in and how you feel that your skills will transfer to their company and role. EG: I have a solid background in finance having worked in a Call Centre providing support to customers seeking help and advice with their mortgage applications. I enjoy working with others and feel that I have gained a lot of experience in this area. I am a very motivated person who likes to work hard and is exceptional at working to tight deadlines. I am a confident person who communicates effectively and works in a very organised fashion. I am seeking a new challenging position and I am very interested in the role that you have advertised/very interested in working for your company. I am available for an interview at short notice and I currently am on one months notice in my current position. Thank you for taking the time to read my email and I look forward to hearing from you in due course.